Firm + Balance Mineral Mask Reviews - Is it a Scam or Legit? 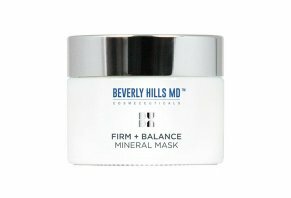 The Firm + Balance Mineral Mask from Beverly Hills MD promises to help you revitalize your skin by cleansing and tightening it so that you achieve a more youthful appearance. Firm + Balance Mineral Mask Review: Get A Youthful Appearance? Produced by Beverly Hills MD, the Firm + Balance Mineral Mask is a mineral-rich clay treatment that’s designed to tighten and revitalize your face after a few weeks of use. The company states that the mask can be used as a way to boost the effects of your regular skincare routine so that you achieve brighter, more youthful looking skin. Naturally, these claims aren’t unique in the world of skincare products. Will the Firm + Balance mask succeed in giving you younger looking skin? We’ll answer that question (and more) to help you decide. How Does the Firm + Balance Mineral Mask Work? According to the product website, the Firm + Balance mineral mask is designed to improve your skin’s texture and moisture balance so that it will look firmer and younger. Unlike other mineral masks, the company claims, Firm + Balance goes beyond just detoxing your skin by infusing it with advanced ‘anti-aging nutrients’ that lead to long term results. To use the mask, the company suggests cleansing and drying your skin before applying a quarter-sized amount of product to your face and neck. After letting the product sit for 5-10 minutes, you can rinse it off and pat your skin dry before finishing your standard skincare routine. For the best results, they recommend following this routine at least two or three times a week. The company claims that the Firm + Balance Mineral Mask can be used on all skin types because it relies on gentle ingredients. Even so, they suggest testing a small amount of the mask on the inside your arm before applying it to your face if you often deal with skin sensitivities. What Ingredients are In the Firm + Balance Mineral Mask? Below we’ve posted the complete ingredients list for the mask. According to our research on websites like EWG.org and Truth In Aging, these ingredients are relatively standard for skincare products. They primarily consist of skin conditioners, moisturizers, emulsifiers, and stabilizers. These standard ingredients offer much-needed moisture and can improve your skin’s appearance, but they don’t make the Mineral Mask stand out from other similar products. One way this mask does differentiate itself is with its high concentration of plant extracts. According to skin expert and founder of Skin Care Ox Diane Elizabeth, berry extracts contain lots of vitamins C, D, and E, three vitamins that can help brighten and tighten the skin. A few ingredients within this list stand out to us, which we’ll dive into below. Kakadu Plum: This native Australian plant contains some of the highest levels of vitamin C on record, and it works as an antioxidant to protect your skin from free radical damage. According to the company website, it contains as much vitamin C as 100 oranges. Niacinamide: As a common form of vitamin B3, WebMD tells us niacinamide is an essential nutrient that works to even out your skin tone to hide the appearance of aging. Papain and Bromelain: This mask contains a blend of enzymes from papaya and pineapple, which work together to deliver skin-brightening exfoliation and better cell turnover to help your skin rejuvenate itself. However, we found evidence on the EWG cosmetics database that bromelain can act as a skin irritant for some people. While these compounds are known for having good skin benefits, we couldn’t find any proof that they work above and beyond other products to improve your skin. There’s no doubt that they will offer your skin a certain level of moisturization, but it’s hard to say for sure whether they will give you a firmer, more youthful appearance. What Does the Firm + Balance Mineral Mask Cost? At the time of writing, the Mineral Mask was only available on the Beverly Hills MD website. It costs $92 per bottle, with options to bundle your order by buying two bottles for $164 ($82 each) or three bottles for $234 ($78 each). The company offers a 60-day purchase guarantee, meaning that you can request a full refund if you try the mask for two months and decide it doesn’t meet your expectations. You can initiate a refund by messaging the company through their contact page, or by calling them directly at 1-877-828-5528. What Do Customers Think of the Firm + Balance Mineral Mask? While we couldn’t find any customer reviews for the Firm + Balance Mineral Mask that were independent of the company, the product website highlighted some opinions from previous customers. These reviews we read overwhelmingly positive, as a few reviewers stated that they noticed a difference in their skin immediately and felt that it made them look younger after they used it for several months. We’ve written about a few other products from Beverly Hills MD like the Deep Wrinkle Filler, Dark Spot Corrector, and Lift + Firm Sculpting Cream, and they average at least four stars each. Within these reviews, customers frequently reported either that the product worked as described or that the company was quick to offer them a refund when they requested it. What Products are Similar to the Firm + Balance Mineral Mask? The Firm + Balance Mineral Mask is far from the only product available that promises to improve your skin. Two other competing products include the Pure Body Naturals Dead Sea Mud Mask and the St. Ives Mineral Clay Firming Mask. The Pure Body Naturals Dead Sea Mud Mask costs $14 per nine ounces, and it is a product designed to exfoliate and detox your skin so that you’re left with a smoother appearance. The company promises that each batch comes from the Dead Sea in Israel and is thoroughly tested before getting shipped out. While the product doesn’t contain the range of tropical fruit extracts, the ingredients list consists of natural components like shea butter, aloe vera juice, jojoba oil, and hickory bark extract. While the Dead Sea Mud Mask isn’t meant to make your skin look younger, it’s designed to remove buildup that clogs pores and triggers acne. The product averages four stars out of five after almost 8,000 reviews on Amazon, which shows that hundreds of people think it delivers what it promises. If you’re in search of a face mask that promises to tighten your skin, the St. Ives Firming Refreshment Mineral Mask claims to use kaolin clay to create a cleaner, firmer facial appearance. According to Mountain Rose Herbs, this clay is a versatile product often found in skincare products that is ideal for people with sensitive skin because it offers gentle exfoliation while stimulating circulation. You’ll pay $13 for each six-ounce tube, and the product averages 4.5 stars on Amazon after almost eighty reviews. What’s the right choice for your skin? We think both of these products make sense, and they each have a lower price and more customer reviews than the Firm + Balance Mineral Mask, so you can buy either product with slightly more confidence. That being said, Beverly Hills MD is a reputable brand with a great return policy, so you might find it worth it to give it a try. Here at HighYa, we review a lot of beauty products that purportedly offer anti-aging benefits, so we are naturally skeptical when a company seems to overpromise. The Beverly Hills MD Firm + Balance Mineral Mask contains a lot of ingredients that are potentially beneficial for your skin, but nothing on that list blew us away. That being said, we didn’t notice any red flags, as our research didn’t uncover any adverse side effects from using them. If your goal is to keep your skin looking youthful, there are a lot of measures you can take besides applying a face mask. We have plenty of articles to help guide your research process, from the facts behind crepey skin to whether regular facial spas will help you look younger, what you need to know about a HydraFacial, and how to accept aging as the natural process it is. Once you start looking at the options for taking care of your skin, we think you’ll find the right solution for your situation. Write a Review for Firm + Balance Mineral Mask!